Stamping and coloring are not your only options when it comes to decorative concrete paving. Objects such as pieces of tile or fossils can be embedded into the surface of the concrete before it hardens. Additionally, patterns can be saw-cut or stenciled onto concrete patios, walkways and pool decks. Before selecting your decorative concrete finish, you should browse photos of completed projects to determine what finish you like best. Two other popular options for texturing concrete are exposed aggregate or a rock salt finish. 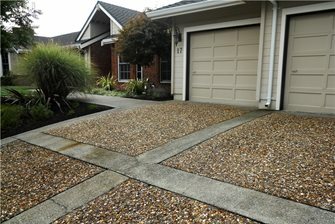 Exposed aggregate consists of embedding larger aggregate in the wet concrete as it is poured or removing the top layer of concrete with a pressure-washer and a topical admixture. 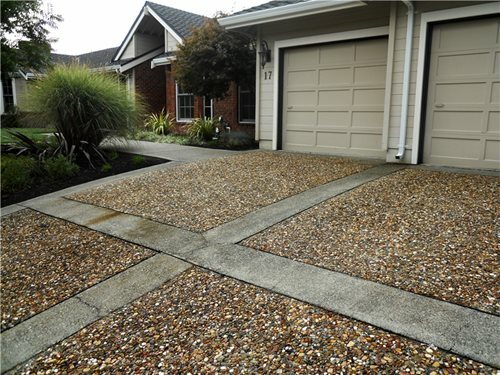 Exposed aggregate has a rugged surface that is nonskid and resistant to heavy traffic and weather extremes. A rock salt finish is a low-cost way of adding subtle texture and skid resistance to plain or colored concrete. Both exposed aggregate and rock salt finishes are excellent for pool decks because of their slip-resistance. A few finishes that are rising in popularity are sand-washed and acid-washed finishes. These finishes expose the top layer of small aggregate in the concrete. This provides a light texture on the surface of the concrete that is great for slip-resistance around pools, on driveways and patios.